Perfectly prepared fish is moist, flavorful, and succulent. When fish is overcooked, it dries out and loses flavor. To cook fish perfectly, remove it from the heat source before it appears fully cooked, while there is still some translucency in the middle. Fish keeps cooking for several minutes after being removed from the heat. If you wait until the fish looks done, it will be dry by the time it reaches the table. After 6-8 minutes of cooking, check to see if the fish is done. Take a sharp knife and use it to peek into the thickest part. If the fish is flaky, but still has some translucency in the middle, it is done. It should not, however, look raw. Please refer the picture on right. This is what it should look like when you remove it from the heat. (Taken from the book, Fishes and Dishes). 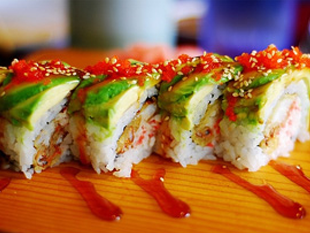 All our salmon is sushi grade, if it is a little rare in the middle, it's completely safe to eat. I have been cooking salmon for the past 20 years and I always use a timer. 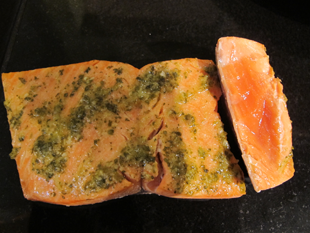 Salmon cooks extremely fast and it is easy to get distracted and overcook it. When pan frying I start out with a base line of 3 minutes on each side and adjust from there depending on the thickness of the fillet and cooking method used. If it is a small tail piece I will reduce the time to 3 minutes on one side and 2 minutes on the other side. For thicker pieces you may need to increase the cooking time to 3 minutes on one side and 4 minutes after flipping. If the salmon in not done in 6 minutes (of total cooking time) I will set my timer for 1-2 minute increments until it is done. In general, you can estimate 8 minutes per 1 inch of thickness regardless of cooking method. Please note, cooking time will vary based on cooking temperature and what type of pan you use. How Can I Tell When It's Done? Salmon will change from translucent (red or raw) to opaque (pink) as it cooks. After 6-8 minutes of cooking, check for doneness, by taking a sharp knife to peek into the thickest part. If the meat is beginning to flake, but still has a little translucency in the middle, it is done. It should not however, look raw. There is more fat in the belly of the salmon (the thinner part of the fillet) and that is why it is still moist when the thicker part is done. I recently learned "the butter knife" method and it has been working great. After roughly 6 minutes of cooking quickly insert a butter knife into the thickest part of the fillet- remove it and touch the knife to your bottom lip. If the knife feels lukewarm then it still needs a bit more cooking. The temperature you are looking for is medium warm. This method does take a little practice, but I have found it to be quite reliable. Prior to removing from heat, I will still cut into the thickest part to check for color. One reason we like to sell in bulk is that we know by the time you are finished with your 10 or 20 lbs you, too, will be a pro at cooking wild salmon. All you need to do is follow my simple guidelines and ALWAYS USE A TIMER! In my opinion, there is nothing more nourishing and delicious than wild Alaska salmon cooked to perfection.